The Anaheim Ducks did the annual post-season reveal of their lengthy list of injuries on Thursday and most alarmingly, defencemen Hampus Lindholm and Sami Vatanen need shoulder surgeries that will sideline them into next season. The Anaheim Ducks are packing up for the summer with regret over a missed championship opportunity, accompanied by pride in their resilient run to hockey's final four. Their Game 6 loss in Nashville will sting forever, but the Ducks hope they've gained experience that will give them another shot at a title. The Ducks won their fifth straight Pacific Division title and reached the conference finals for the second time in three years, but were eliminated when the Predators scored tiebreaking third-period goals in the final two games. However, Anaheim did the annual post-season reveal of their lengthy list of injuries on Thursday and most alarmingly, defencemen Hampus Lindholm and Sami Vatanen need shoulder surgeries that will sideline them into next season. Lindholm will out for four to five months, and Vatanen will be sidelined "longer," general manager Bob Murray said. The defencemen tore their labrums during the Ducks' post-season run, but kept playing. Vatanen's health could interfere with the machinations around the expansion draft and the annual shuffling necessary for Murray to keep his team on budget. Murray seemed cautiously confident he will find a way to keep his core largely intact, although he also said the Ducks might do something that's "shocking" to fans. Forwards Patrick Eaves and Rickard Rakell were sidelined by high ankle sprains, leaving the Ducks to play their final two games without two players responsible for a combined 65 goals in the regular season. Logan Shaw had a groin injury, and Nate Thompson kept playing with a hairline fracture in his ankle. Kevin Bieksa tore a knee ligament and missed only nine games. 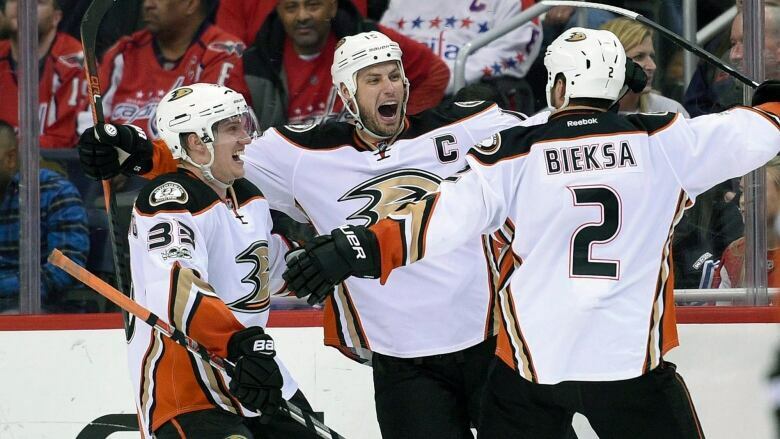 Kevin Bieksa revealed he played with a torn MCL this postseason. "I tried to get back as quick as I could and did what I could do." Eaves and backup goalie Jonathan Bernier are among the Ducks' free agents, and both veterans are aware they could be done in Anaheim. Nate Thompson and defenceman Korbinian Holzer are also out of contract. "As one door closes on somebody, there's another one opening for somebody else," coach Randy Carlyle said. "It's kind of cruel to describe it that way, but that's the reality of sports." Murray's major problem with the Ducks' post-season performance was their poor special-teams play, which suggests possible changes in Carlyle's staff. Carlyle inherited Bruce Boudreau's assistants when he returned to the club last year. But one year after Murray was worried about maximizing the championship window for Anaheim's over-30 veterans, the Ducks are increasingly confident they've got enough talent coming up through their system to keep that window open indefinitely. After breakthroughs this season for Rakell, Jakob Silfverberg, Nick Ritchie and defencemen Josh Manson, Brandon Montour and Shea Theodore, the Ducks have yet another enviable group of dynamic young talent seemingly ready to break into the NHL next season, including defenceman Jacob Larsson and forwards Sam Steel and Max Jones. "We've got some veteran players, yes," Murray said. "But we've got some really good young kids, and more kids coming. We're in a good spot to move forward ... Some of our kids are nowhere near their prime yet, so you've got to look at that and give it a little more time."